→How to Add an Official Contact Form Widget to Blogger? Blogger’s developer team is really working hard for the betterment of Blogger. Few months ago, They introduced Wikipedia Search Box widget. Now they have launched another widget i.e Contact Form Widget which allows you to add Official Contact Form widget to either sidebar or footer depending upon the location of widget box on your Template. It is a good news for blogger users because it will not disturb the page loading speed of Blog. This post contains the instruction for adding Official Contact Form widget to blogger. Why You Should Use Official Contact Form Widget in Blogger? 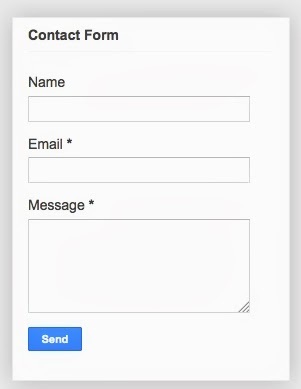 No Need of Using any Third Party Contact Form Any more. Doesn’t Show any impact on Page load Speed. Simply, Follow the below given steps and add the official Contact Form widget to blogger. After that Click on “Add a Gadget“.The screenshot of the same is shown below. It’s a nice widget for blogger users. Now they can use it in their blog. Officially, It doesn’t allow any facility to use in Pages. However you can use it in sidebar, Footer, Below Post or Above Post depending upon your Templates. I have tested it in both Default and customized blogger templates and is working fine everywhere.